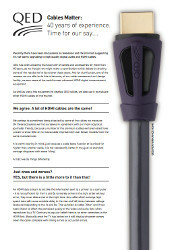 There is now a vast choice of diff e rent cable types, designed to suit every need. Unfortunately, consumers are now confronted by a bewildering array of claims and counter- claims, turning what should be a straight forw a rd purchase into something of a nightmare! This situation is not helped by the mysticism and pseudo-science which is all too often used by some marketing departments. 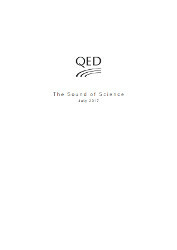 This technical guide is a summary of in-depth scientifically-conducted research, with measurements and listening tests, carried out by QED into loudspeaker cable effects. Our aim was to develop new ranges of high-perf o rmance cables based on the results of these investigations and the current QED loudspeaker cables were developed as a direct result. Many lessons were learned, which have also influenced our interconnect cable design. The listening sessions were vital: QED engineers are all too aware that measurements alone are not the whole story. It would be tempting to claim that they tell you everything, though this is clearly not the case. On the other hand, if any cable introduces measurable errors and distortions as a result of being inserted between the amplifier and loudspeaker, it obviously cannot reproduce music accurately. QED believes cables should be as accurate, transparent and neutral as possible and it is with this credo that our cable development is undertaken, based on Genesis and guided by exhaustive listening evaluations. At first glance the role of loudspeaker cable would appear to be rather unglamorous, simply conveying the signal between amplifier and loudspeaker. In practice, though, diff e rences in cable perf o rmance can readily be discerned by most listeners - though some diehards still deny even the possibility. 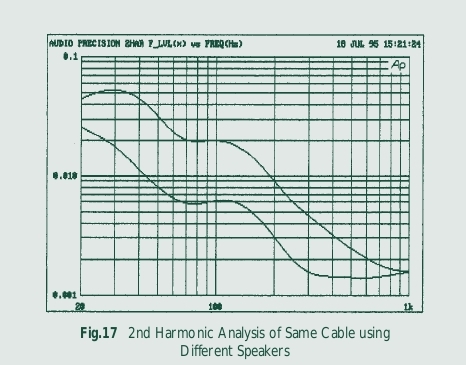 Clearly there are factors in cable design and construction which influence sound quality. Bearing in mind that no component can improve on the analogue signal passing through it (but can only change and degrade it) the ultimate role of any loudspeaker cable should clearly be to transfer the signal energy between amplifier and loudspeaker without loss. Resistance (R), Capacitance (C), Inductance (L) and Conductance (G). Most power amplifiers are amplifying devices which achieve fidelity by comparing their output signal with their input. This is called 'negative feedback', or NFB. Any error appearing at the output of a NFB amplifier is effectively corrected by the amplifier automatically applying the opposite error at its own input. 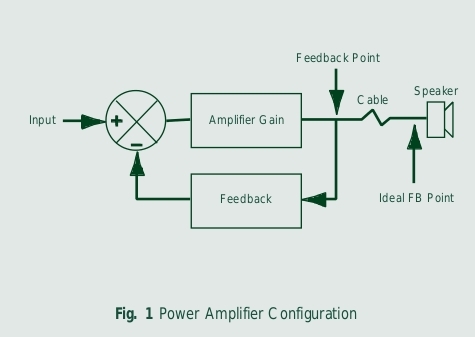 As can be seen from the diagram in Fig.1, an NFB amplifier can only attempt to correct errors that appear at the point of feedback. Errors at the loudspeaker input due to the influence of the cable remain uncorrected: the cable is beyond its jurisdiction. Some NFB amplifiers have been designed to take their feedback from the loudspeaker terminals in an attempt to counteract cable effects, though this type of configuration is very rare. One objective assessment of a cables perf o rmance would therefore be to compare its input (at the amplifier output) to its output (at the loudspeaker input). Any difference amounts to degradation of the signal. Terms used to describe the subjective effects of cables, range from positive ones such as; 'transparent ', 'coherent', 'tight', 'detailed', and 'rhythmical', to negative comments such as 'grainy', 'loud', 'forward ', 'twangy' and 'smeared' for example. 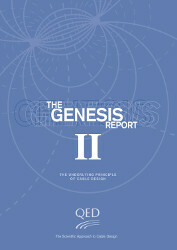 Our Genesis research has shown that some of these can be explained by analysing electrical measurements. Cable samples re p resenting a broad range of prices, technologies and marketing claims were tested, each sample measured driving a real loudspeaker load. The two graphs shown in Fig. 2 and Fig. 3 a re frequency responses. The upper trace was taken at the amplifier's output and the lower curve was measured 'after' the cable (at the loudspeaker's input terminals). There are clear differences in performance between the two cable types. The lower of the two curves in Fig. 2 is for a very low loop resistance ribbon cable (sample 10 in our tests), while Fig. 3 shows the effect of a dual-stranded solid-core cable (sample 7). The ripples in the curve are due to the variations in load impedance of the loudspeaker system within the audio bandwidth influencing the voltage 'dropped' across the cables impedance at different frequencies. The loss in the cable is effectively the difference between the upper and lower curves in both Fig. 2 and Fig. 3. Clearly, there is a greater loss due to the solid core shown in Fig. 3 due to its greater DC resistance. This is not merely academic, because the overall frequency response of the loudspeaker will be modified by these variations (amounting to as much as -0.8dB at 200Hz for Fig. 3). The resultant responses shown in both curves are typical of a bass reflex (ported) loudspeaker system using a steady-state sinewave input signal. Real signals are non-sinusoidal (comprising many frequencies simultaneously) and the loads presented by loudspeakers will be complex (complex meaning that current and voltage are not always exactly in step, or in phase). As a consequence, there will be a far greater dynamic amplitude loss across the cable when playing music than would at first be inferred by examining these steady- state curves. 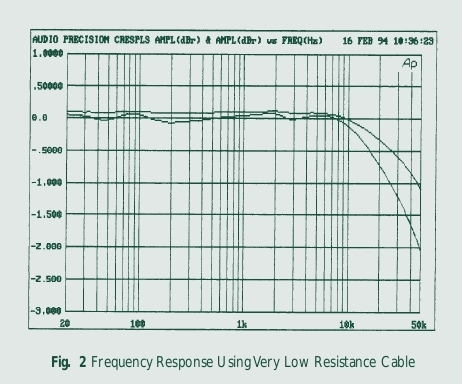 Given this clear evidence that low resistance is necessary to ensure the flattest possible frequency response with real-world loudspeakers, it is surprising that there has been a trend away from low-resistance cables to higher resistance solid-core types. One of the major reasons quoted in manufacturer's marketing materials has been the claimed reduction in skin effect obtained from the use of low-cross- sectional- area solid- core cables. Skin effect is a phenomenon normally associated with high- frequency transmission lines. When an alternating current flows through a conductor, an electromotive force (EMF) is induced due to the changing magnetic flux within the conductor. This causes the current density to decrease at the centre of the conductor compared to that near the outer surface. In effect, the area through which current flows is reduced, with current diverted from the core. The result of skin effect is a rise in cable impedance at very high frequencies, due to the shrinking effective conducting area increasing the total impedance. (Curiously, unlike inductance, skin effect does not introduce phase shift but does give rise to increased power loss in the cable). In radio-frequency applications (way above the audio range) skin effect can be a serious problem, overcome by silver plating to reduce resistance at the surface, where the bulk of the high-frequency current flows. In audio cables, the assumption that skin effect is worth tackling has resulted in loudspeaker cables with single strands of diameter equal to or less than twice the effective signal penetration depth (the depth at which current density is reduced to 63% of its normal value) at some high audio frequency. The idea being that the cable will operating at all frequencies in reduced- current-density mode. By doing so, the symptoms of skin effect are swamped (though it has not been beaten) while the overall impedance of the cable has been increased at all frequencies. There has certainly been much debate about the audibility of 'skin effect', most engineers questioning its very presence at audio frequencies. To assess its magnitude objectively, we selected four loudspeaker cable samples for comparative measurements of high-frequency phase shift. Two of these were large - diameter multi-stranded cables and two were low-cross- sectional area 'low-skin-effect' types. Initially, the basic characteristics of resistance, inductance, capacitance and conductance were measured (known as lumped parameters). These figures were then used to calculate a theoretical prediction of phase shift, when driving a load. It is important to remember that these theoretical figures did not take into account skin effect and were based purely on the lumped parameters. The results are shown in Fig. 4. 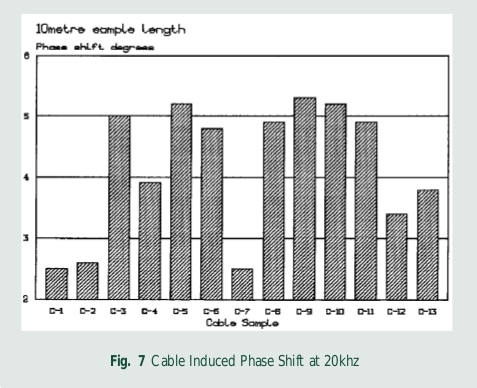 Actual phase shifts into the same value load were then measured for each cable sample and the results are shown in Fig. 5. Contrary to what one may expect if skin effect were significant, there is remarkably close correlation between the actual and predicted values. Only above 80kHz is there a significant deviation in the multi-stranded cables (if 2% at 100kHz can be considered significant!). The two phenomena contributing to these diff e rences are skin effect and, possibly, proximity effect. The latter is an increase in current density on the inside faces of parallel conductors and is most acute for closely-spaced strips conductors. Interestingly, measured values of phase shift are generally lower than the theoretical predictions because skin effect, which is resistive in nature, increases the AC impedance of cable without introducing phase shift of its own. Curiously, skin effect actually reduces phase shift by countering the inductive reactance of the cable. (Those who wish to take this further are referred to text books on AC phasor theory). 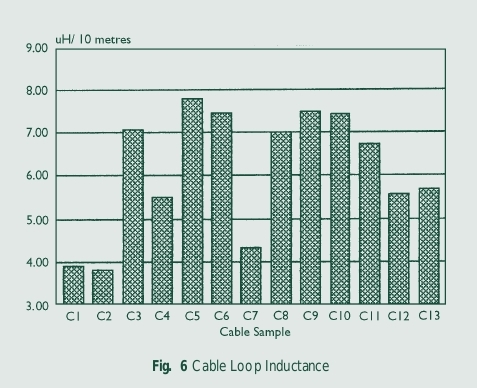 Note that cable sample 7 in Figs. 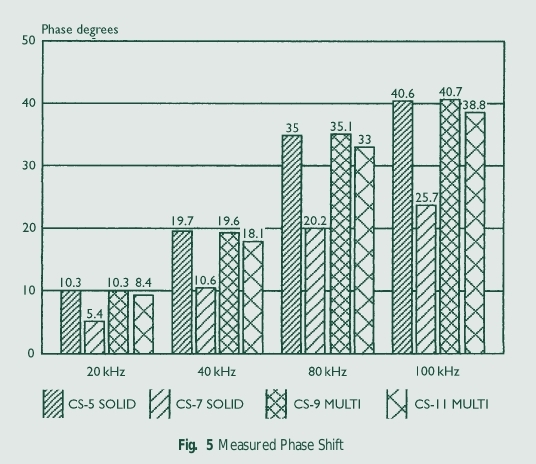 4 and 5 exhibits lower phase shift than the others simply due to its lower inductance. 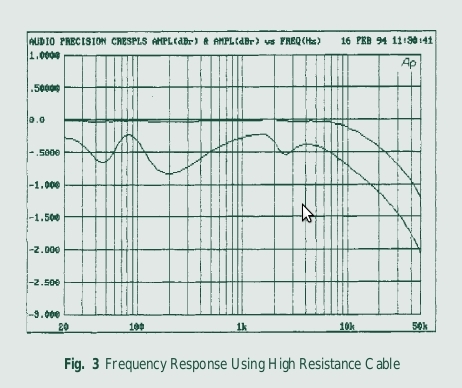 The effects of inductive reactance on AC signal phase shift for a number of tested cables is shown in Figs. 6 and 7. The higher the inductance, the greater its effect on phase shift. Examining the geometry of each cable sample revealed that the majority of the multi-stranded cables were inherently inductive. In cables, the wider the conductor spacing, the greater the inductance. Many of the multi stranded loudspeaker cables available feature conductors spaced widely, some more than three times the conductor diameters, resulting in higher values of inductance. Averaging the inductive effect across our samples gave an effective phase shift of 0.42 degrees per metre. So, for a 10 metre length, this would give 4.2 degrees of phase shift. In practice, the cable inductance is in series with (in addition to) an output inductor in the amplifier (built-in to improve the amplifier's high-frequency stability), so the overall amplifier inductance is effectively increased by the cable. 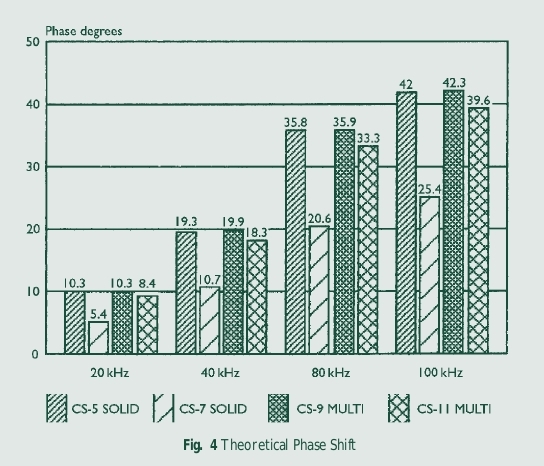 At present, the absolute audibility of frequency - related phase shift is relatively unknown, although amplifiers that exhibit poor phase response are often criticised as being 'grainy'. Surprisingly, amplifier phase shift is rarely mentioned, yet it is not uncommon to measure in excess of 15 degrees at 20kHz in commercial designs. Another effect of inductance is high-frequency amplitude loss, due to the increase in cable impedance at high frequencies (inductive reactance, XL rises with frequency). So, as frequency rises, there is less signal remaining at the loudspeaker terminals. Interestingly, high cable inductance can also be responsible for a rise in the output in the voltage at the loudspeaker terminals due to the amplifier's output! This is caused by the complex interaction between (Capacitance Load) inductive and capacitive reactances and resistance producing a damped resonance. This can be a problem with electrostatic loudspeakers, which represent a higher capacitance load than conventional moving-coil loudspeakers. An example of resonant peaking is shown in Fig. 8, shown with the raw amplifier output. Here the increased impedance of the cable at high frequencies produces a considerable loss of signal level when combined with the amplifier's own roll - off. Loudspeaker cable conductors are sheathed with insulation, otherwise known as dielectric, to prevent shorting. This inevitably introduces additional losses because all dielectrics absorb some energy. The dielectric loss is sometimes referred to as the dissipation factor or Tan ? (almost the same as Power Factor) and this increases with frequency. As a general guide, the higher the dissipation factor at a given frequency, the greater the power loss within the dielectric. 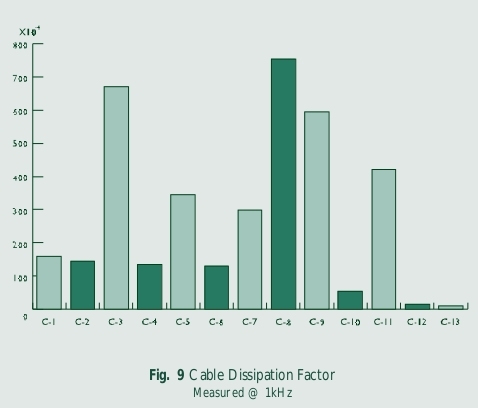 A selection of dissipation measurements on samples from our cable selection is shown in Fig. 9. It shows a surprisingly wide spread of results. All dielectrics also possess a property known as permittivity. The lowest permittivity dielectric, (a part from a vacuum), is air and this introduces the lowest loss of any practical material. The greater the permittivity, the greater the loss and also the higher the capacitance. This is because permittivity is a measure of how easily the dielectric 'permits' the establishment of the electric field, which is the very cause of the capacitive effect. Conversely, the lower the permittivity (the closer to a vacuum) of a dielectric, the lower will be both the losses and capacitance. If a vacuum is taken as a re f e rence of 1.0, this yields the Dielectric Constant Er for any dielectric. Air works out to 1.0006 which, to all practical intents and purposes, is virtually the same as a vacuum. Capacitance is also governed by the spacing and diameter of the conductors. The greater the gap between any two conductors in a given dielectric, the lower the capacitance, (the reverse is true of inductance). A quick look at the table above should make it quite obvious that designing a cable with low inductance and capacitance is particularly difficult when poor-quality dielectrics are used. The majority of lower-priced cables, and many in our sample, used PVC dielectrics, which cause inherently greater capacitance and dielectric losses. Whatever is done with the conductor spacing and diameter, such cables are at a distinct disadvantage, with either greater capacitance or inductance (or both). Another quality of the dielectric which affects cable performance and is tied in with dielectric loss is conductance (G). Conductance is a measure of how well two conductors are insulated from one another. The lower the conductance (G), the greater the insulation resistance (Rp). Higher quality dielectrics are inherently better insulators because there are fewer 'free' electrons to carry electric current within the material when a signal is applied. 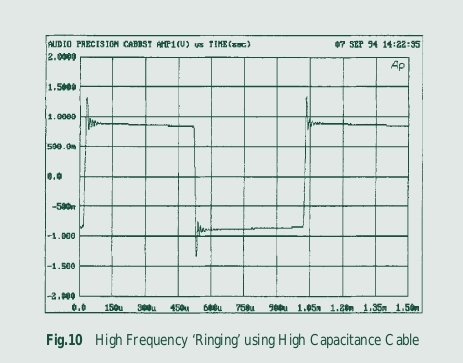 In theory at least, cable capacitance should have little effect on system perf o rmance, because the cable is driven by a very low source impedance, typically fractions of an Ohm for most power amplifiers. Though the capacitance forms a low-pass filter when connected to this impedance, its effect on frequency response is typically minuscule. More insidiously, unduly high cable capacitance in a speaker cable may indicate poor dielectric quality and high dielectric losses. Some esoteric cables employ a number of separately insulated paralleled wires to form the two conductors. With certain geometries and lower-grade materials, this can cause capacitance to rise to a high level. One such sample in our test group had a parallel capacitance of some 1375pF compared to the average sample capacitance of 500pF for a 10metre length. Another factor to be considered with speaker cables is amplifier stability. In some cases, a little extra capacitance at the output can make an amplifier oscillate, overheat and even self-destruct. Or it may oscillate momentarily at high radio frequencies during operation and show no obvious symptoms. Well - designed amplifiers normally have a good gain/phase margin, which ensures that small extra phase shifts due to increased capacitance do not cause such problems. Unfortunately, some commercial designs do not have sufficient gain/phase margins for unconditional stability and it is these which cause problems with long lengths of higher -capacitance cables. Ironically, inductance is likely to be low for high-capacitance cables, leading to a further reduction in the stability margin. Even if not outwardly unstable, sound quality can suffer, with harsh and forward-sounding results as the amplifier sits on the edge of instability. Fig. 10 shows instability due to high capacitance cable as ringing on a 'fast' square wave signal. With a single pair of conductors in a given dielectric, reducing their spacing reduces inductance and raises capacitance, while increasing their spacing has the opposite effect. Consequently it is often assumed that it is not possible to buck this trend and reduce inductance without increasing capacitance. Indeed, it has almost become embedded in audio folk law. However, comparisons carried out between different conductor layouts, even with similar total conductor cross-sectional area (and hence similar DC resistance) showed that this is possible, even with the same dielectric material, simply by rearranging the conductors (see Table 1). These are the results of tests carried out on cables which came out of Genesis research and are shown to illustrate the profound effects of geometry. Resistance, inductance and capacitance were all measured with standard Qudos and Profile 8. Standard Qudos is two bunches of 79/0.2 in figure - of - eight layout. Profile 8 is eight bunches of 19/0.2 in flat layout. The cross sections and therefore DC resistances are about the same. LDPE insulation is used in both cases. Therefore any differences in inductance and capacitance are due to geometry. Profile 8 can be configured in a number of ways. Table 1 shows results with the inner four and outer four used as a pair and also with the left four and right four used as a pair. Compared to standard Qudos, Profile 8 connected using inners and outers shows a significant reduction in inductance and actually slightly less capacitance, which is counter to the 'rule of thumb' often quoted. Conversely, the left/right configuration gives similar inductance to Qudos but with capacitance almost halved. As a matter of interest, the geometry also affects the characteristic impedance as shown, though this is only of academic interest. One subjective effect often noticed by listeners is an increase in soundstage width when certain speaker cables are used. At first glance it is difficult to see how this could happen, considering the high electrical isolation between the stereo channels. We thought one explanation may be that acoustical coupling exists between left and right channels via the loudspeakers themselves. Ideally, the left speaker should vibrate only with left-channel signals and vice versa. Each channel of the amplifier ideally applies electro- magnetic breaking to its own loudspeaker preventing it from being moved by air waves from the other one. It should achieve this breaking, or damping, due to its very low source resistance, but in using Lower Resistance Cable. practice the cables resistance intervenes, increasing the source resistance 'seen' by the speaker and reducing damping. So, each loudspeaker can vibrate in sympathy with the (delayed) output from the other, with subsequent narrowing of the sound stage. If this were true, low-resistance cables would give a wider sound stage. Though seemingly far-fetched, measurements of loudspeaker terminal voltages shown in Figs. 11 and 12 show just this effect. The peaks marked with an 'X' are the amplitudes of signals generated by the movement a non-driven loudspeaker's diaphragm in response to test tones fed to the other channels loudspeaker. 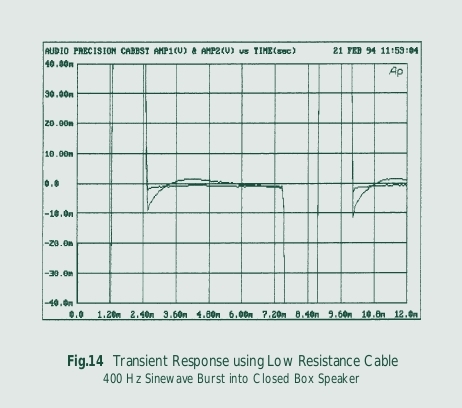 The 500Hz terminal voltage is reduced by about 10dB lower with the lower- resistance cable shown in Fig. 12. As mentioned earlier, loudspeakers in general are very complex electrical loads which generate voltages (due to sound impinging from outside, and energy stored inside) which are fed back to the amplifier (also known as back EMF). This can occur as discussed in the last section, or when subjected to a sudden change in signal amplitude, when the speaker will 'ring', producing an output when there is no input. The amount of ringing depends on the amplifier and cables combined ability to 'damp' and control the unwanted oscillation. Clearly shown in Fig. 13 is the amplifier's output and the voltage at the speaker terminals. At just after 2.4ms, when the amplifier output drops to zero, the speaker voltage continues negatively, then rises and 'overshoots' positively before settling. This re p resents unwanted diaphragm movement. Shown in Fig. 14 is the same loudspeaker with lower resistance cable: the measured improvement is clear. 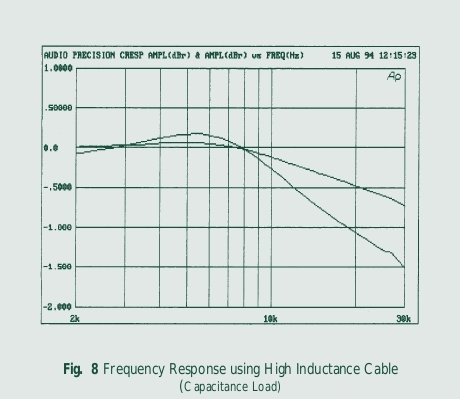 Cable inductance also increases the overall impedance between amplifier and loudspeaker and our measurements showed this to have further harmful effects on transient performance. The loudspeaker's complex mechanical/electrical system works best it seems when damped by as low an impedance as possible, over the whole frequency range - not just at low frequencies where the cone movement is controlled by DC resistance. 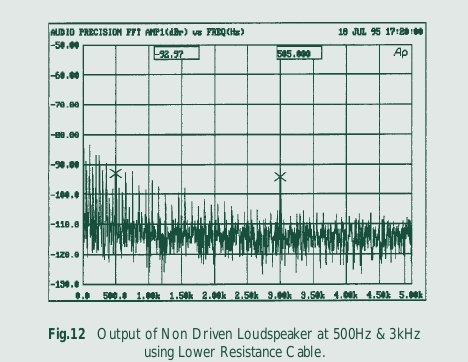 Loudspeaker cable electrically distances the speaker from the amplifier in several ways, with DC resistance spoiling frequency response, damping and separation as we discovered. 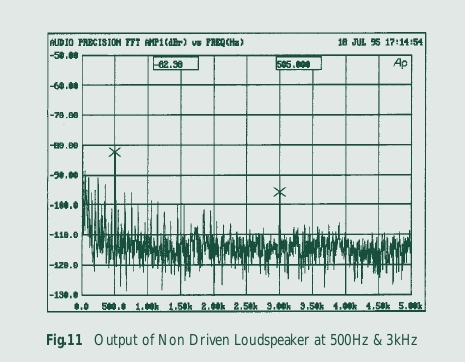 In addition, measuring distortion at the loudspeaker input terminals showed figures significantly higher (particularly second harmonic) than at the amplifier output. We found that the deterioration in quality (and fidelity to the original) depends largely on the cables DC resistance and loudspeaker type. Shown in Figs. 15 and 16 are plots of second harmonic against frequency. The top trace in each case shows the distortion at the loudspeaker, while the bottom traces show the amplifier's output. In Fig. 15 (high resistance cable (0.065 ohms per metre), distortion is roughly three times that in Fig. 16 with low resistance (0.004 ohms per metre) cable. In contrast, Fig. 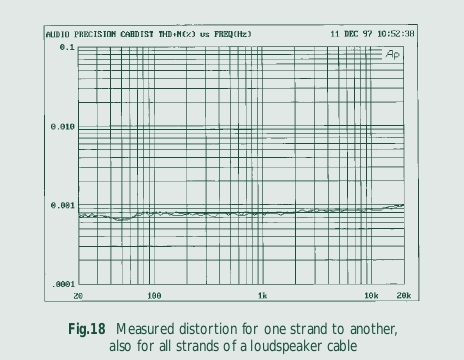 17 shows the effect of different loudspeaker loads with the same cable. Note, the cable does not itself cause distortion (its DC resistance is essentially linear), rather its presence prevents the amplifier's feedback from accurately correcting distortion generated by non-linearities within the speaker system. Connecting the amplifier directly to the speaker showed distortion accurately corrected to within a small percentage of the amplifier's non-loaded condition. 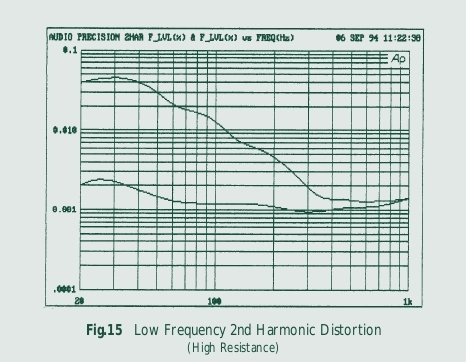 Further investigation is required, but it seems that distortion at low frequencies is influenced partly by the resonant frequency of the speaker enclosure. In addition, mid and high-frequency distortion figures were significantly worsened by increased cable inductance, which increases cable impedance and consequently reduces the damping effect of the amplifier and cable on the loudspeaker. There is a view that multi-strand cables introduce 'diode' effects due to current jumping between strands within the cable and therefore crossing very many metal/oxide/metal junctions between strands as electrons travel from one end and the other. (This is sometimes said to be caused or worsened by 'skin effect' pushing the current towards the surface at high frequencies). Making the assumption that the current does jump (there is no evidence for this but, as we found, skin effect would not seem to be a significant influence) we put signal in via one strand and measured the outcome from a diff e rent strand. Even using the Audio Precision AP1 down to the very lowest levels no increase in distortion compared to using all the strands could be found (see Fig. 18). This shows both cases - so close that they could just as easily be repeat tests of the same measurement. In this instance it's a case of not proven. It seems inter-strand diodes do not exist, or of they do they are shorted out by the many good conductors pressed together over the cables length. This term is occasionally mentioned in connection with audio cables, although it is mainly associated with transmission lines. Characteristic impedance is crucial in determining the correct loading and source impedances for high-frequency transmission lines, to prevent the creation of unwanted reflections and standing waves. To work correctly, a transmission line must be terminated at both ends by a resistive load equal to the characteristic impedance. Loudspeaker cables are not transmission lines, because the longest are only a fraction of the wavelength of the highest audio frequency. In any case, even if they were, they cannot be terminated at both ends with the correct impedance (an 8 ohm source impedance would ruin damping while seriously compromising frequency response and distortion). Measurements to test for cable asymmetry in the samples, some of which were directionally marked by their manufacturer, revealed little to suggest the existence of directionality. Blind listening tests also revealed that listeners were unable to discriminate a cables direction. The lay of the cable, on the other hand, was found to have a measurable influence on performance, so to be reliable, any listening or measurement tests would require identical cable positioning for each direction. Although there will always be those who remain sceptical about the importance of loudspeaker cables, the results of our research clearly indicate that system performance can be improved or degraded depending on the loudspeaker cable used. Analysing the compiled data revealed a fair degree of correlation between sound quality and measured performance. Low cable resistance is of paramount importance if high sonic performance is to be attained, but this should not be achieved at the expense of other crucial parameters. 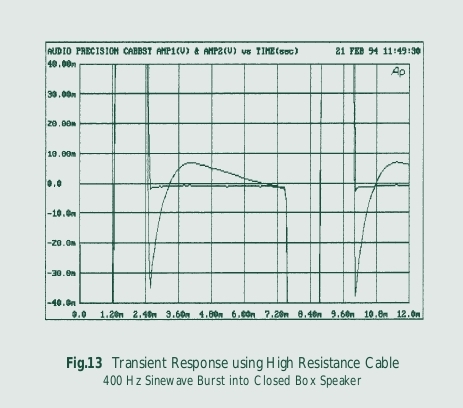 High cable resistance results in several undesirable consequences: frequency response aberrations, impaired transient response, increased induced distortion and reduced inter-channel separation. All cables exhibiting high resistance measured badly in these areas. Subjectively, their performance was highly dependent on the partnering loudspeakers. The forward midrange presented by these cables correlated closely with their subtly shaped frequency responses. High cable resistance also reduced dynamic impact with heavily scored music. Cable inductance is a prime cause of high-frequency attenuation and phase shift. Inductance causes impedance to rise with frequency, resulting in attenuation of the very upper frequency range at the speaker terminals and sometimes even peaking. In addition, inductance increases distortion at the loudspeaker terminals and degrades the loudspeaker's overall transient response. 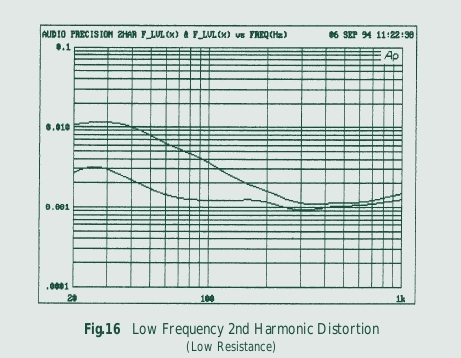 So, low inductance is required to achieve a flat frequency and phase characteristic, low distortion and good transient response from the loudspeakers. Skin effect is shown to be of minor significance when considering cables of moderate cross sectional area. Cables with larger conductors, although exhibiting greater skin effect, also tend to be more inductive, which causes greater high-frequency signal loss. Only at frequencies well above the audio range does skin effect increase to a point where it could be considered significant. Though the percentage rise in AC impedance of a high cross-sectional are a conductor will be greater than that of a low cross - sectional - area conductor, its effective AC impedance (and DC resistance) will still be lower. Skin effect also has the unexpected side effect of reducing the level of phase shift caused by cable inductance at high frequencies. Dissipation factor proved to be a very strong indicator of sound quality. Most of the better sounding cables used superior dielectric materials: PVC insulated cables gave the worst sound quality. Cables which measured badly for dielectric loss appeared less able to reveal subtle detail, losing some of the atmosphere revealed by better cables with superior dielectrics. Loudspeaker cables interact both with amplifiers and loudspeakers. Consequently, some cables gave varied results in different systems. Those which performed most consistently were those with minimal inductance, capacitance and resistance. Unless an amplifier relies on inductance to maintain stability, keeping the speaker cables as short as practically possible optimises performance. High cable capacitance is best avoided, because it can result in amplifier instability, which can spoil sound quality and reduce amplifier reliability. Despite an increasing tendency for manufacturers to mark cables directionally, no evidence was found under controlled conditions to support the notion that speaker cables are directional. It was found, on the other hand, that merely laying a cable differently could affect the inductance and capacitance. Recently, solid-core conductors have increased in popularity on the basis that, if made thin enough, the solid conductor will show less variation in loss at high and low frequencies than a thicker stranded conductor. Our findings suggest that it is more likely to be the insulation and geometry of many solid- core cables which are responsible for their generally higher performance than stranded conductors. In any case, simply parallelling up conductors, whether solid or stranded, reduces inductance, which has a far greater influence than skin effect. The stranded cables tested had higher inductance and leakage than many of their solid-core counterparts which generally used separately-insulated wires (giving lower inductance) with higher- quality dielectrics (giving lower leakage losses). No evidence was found to support the popular theory that stranded cables suffer from distortion due to diode effects between strands, so this seems to be something of a red herring. Electrical conductivity was slightly superior for cables utilising high purity copper (>99.99% pure). Greater improvements to conductivity were found with silver-plated copper and pure silver conductors. Generally, within this group of cables, the geometries and dielectric materials were more significant than conductor metallurgy in determining a cables sonic performance. As summarised in (1,2,3,4 and 5) the most accurate and consistent- sounding loudspeaker cable will have minimal DC resistance, inductance and capacitance combined with low dielectric losses. All our research findings confirm this simple conclusion. Conductors designed with small cross- sectional are a in an attempt to avoid skin effect (which is not an issue anyway at audio frequencies) have higher DC resistance, with obvious harmful consequences. Through Genesis, QED's engineers have bucked the over- simplified 'rule' relating inductance to capacitance. Capacitance and dielectric losses have been reduced by choosing a suitable high-quality insulation material (low-density Polyethelene). In addition, minimising the insulation wall thickness and designing narrow webs (consistent with mechanical integrity) the ratio of air to solid dielectric has been improved, thus further reducing capacitance and dielectric losses. By optimally orientating multiple parallel stranded conductors, QED has been able to reduce both inductance and capacitance below that predicted from a single pair of the same DC resistance. The use of stranded conductors of good total cross section has kept DC resistance low. 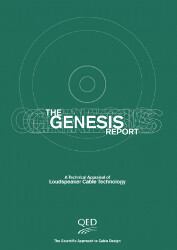 The result is a range of low-loss transparent - sounding loudspeaker cables of superior performance. The correlation between insulation and sound quality has also influenced the design of QED's interconnects, which use foamed LDPE to increase the air/solid dielectric ratio and maximise sound quality.